I used to think of Turkey as a larger version of Istanbul. With its wonderful mix of European and Asian cultures, an overwhelming Grand Bazaar, high minarets, strong coffee and wonderful Turkish delights being sold at every corner. But there are some places in this huge country that were inhabited long before Ottoman, Byzantine, or even Roman Empire existed. The south coast of Turkey was once a home to Lycia, an ancient federation of city-states that existed at the same time as ancient Egypt. The best part of visiting was getting there is by the sea. 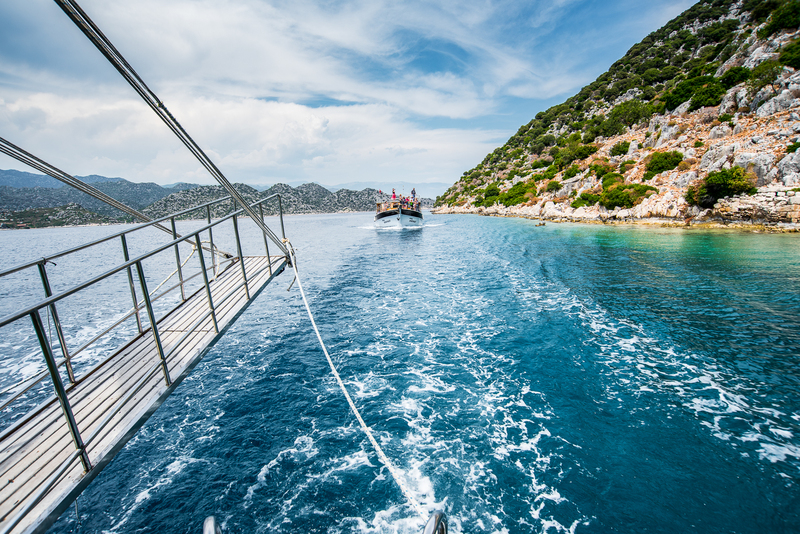 Many boats run trips from Kas and Cayagzi, the harbor of Demre. 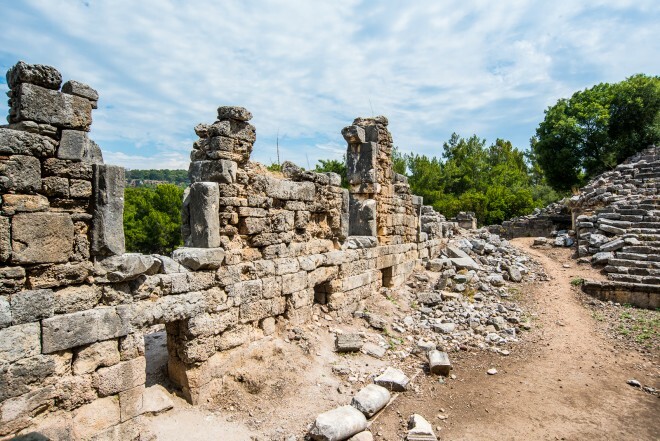 The sea-trading city of Simena located on Kekova Island was once a part of Lycia. 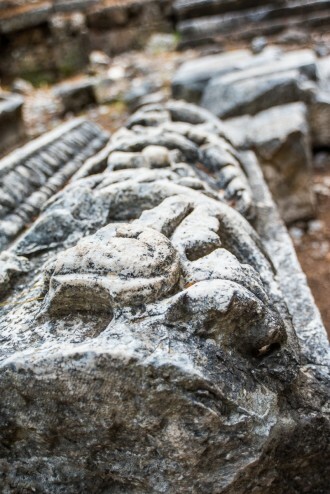 Simena was destroyed by an earthquake during the 2nd century and partially sank beneath the waves. It is still possible to see the city ruins above the shoreline and below the clear waters of the Mediterranean. The island, where the ruins are located, is now uninhabited. 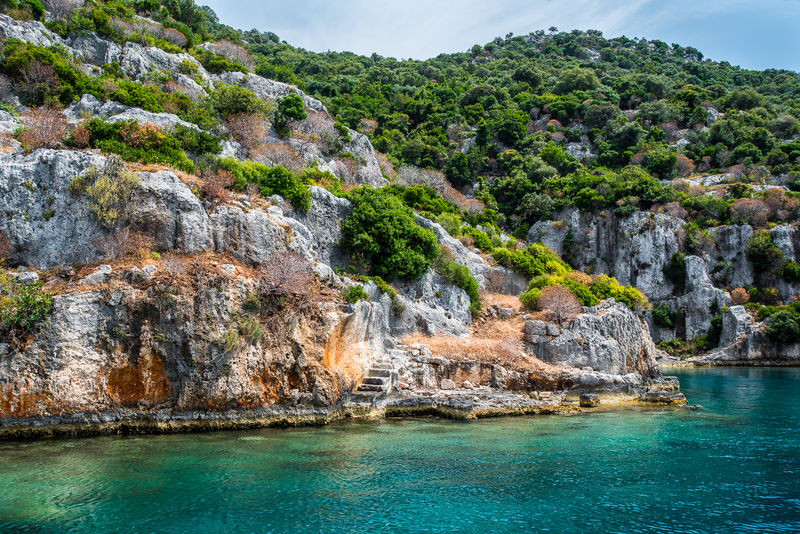 In 1990 the Turkish government declared it to be a Protected Area, and all kinds of water activities (diving, swimming, snorkeling) are now forbidden without a special permit in the area around the sunken city. From Antalya take the main road 400 in the direction of Kumluca and further to Demre/Kale. Near Finike the ruins can be easily spotted on both sides of the road. 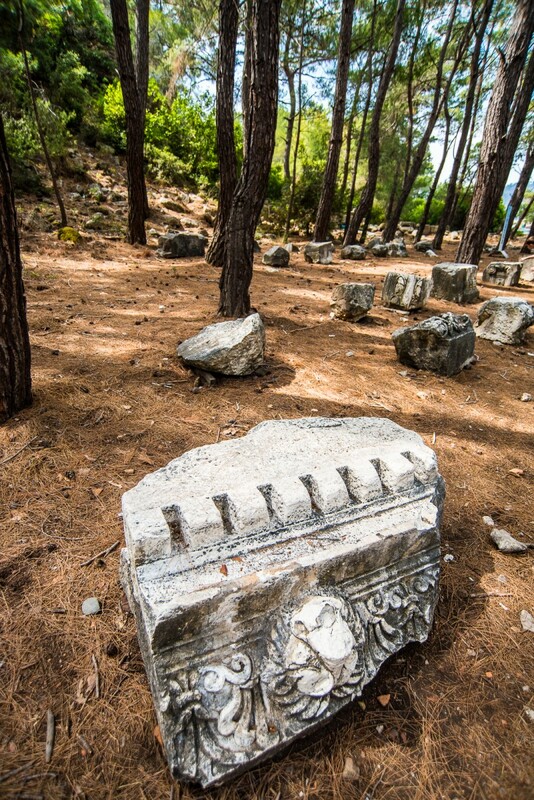 Limyra was one of the oldest cities in Lycia and even once was proclaimed a capital of the lycian league. The city was conquered by Cyrus the Great and would stay under Persian control until the very end of its days, when it was conquered by Alexander the Great, in the second century BC it eventually became a part of Roman Empire. Among the ruins of Limyra the most impressive are those of Roman amphitheatre and distinctive rock-cut Lycian tombs Lycia in the sides of cliffs. 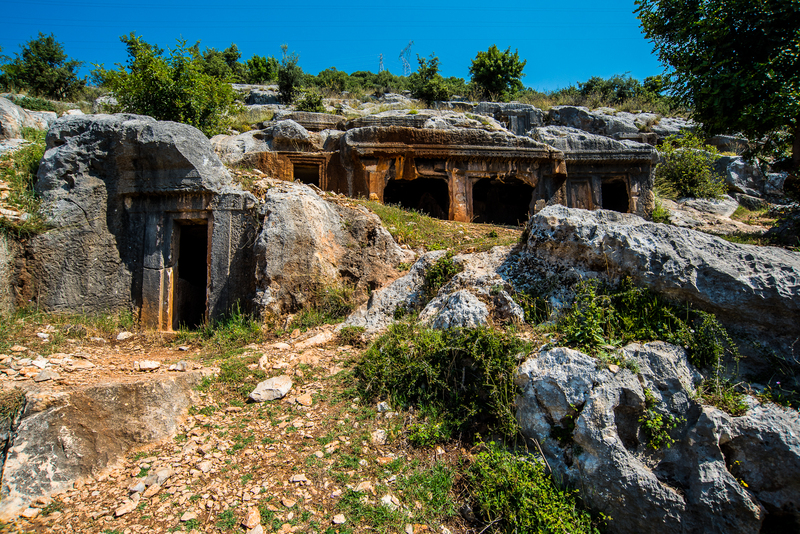 Lycians believed that their dead will be transported to the afterworld by a siren-like creature, so often placed their tombs along the coast or in the cliffs for an easier access from the air. About 12 km from Kemer, north of town Tekirova. The site is located within National Park, entrance fee is $6(20TRY). 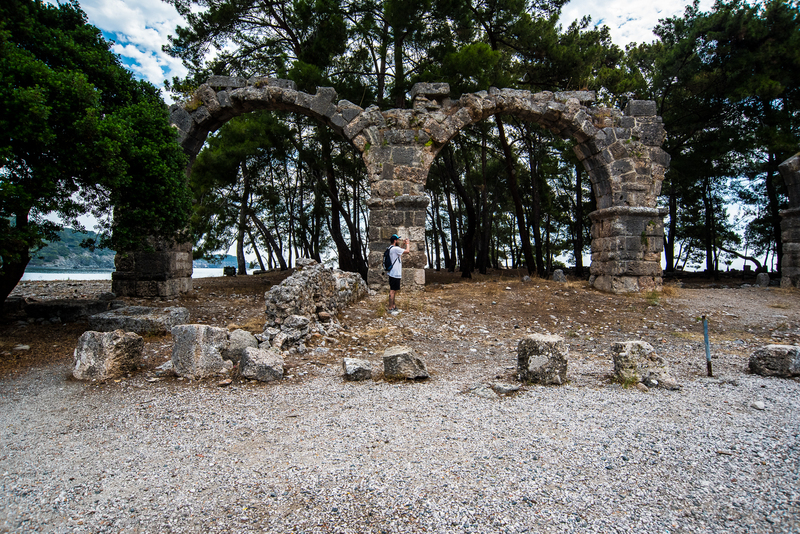 One of the most impressive archeological sites we visited was the remains of ancient Phaselis. The city was founded by Greek colonists, that most likely came from Rhodes. The unique location of the city, with it’s tree natural harbours, made it a prosperous port and important trading center. One of the harbours (called “Sun Harbour”) if still being used today, mostly for tourist boats. The Roman aqueduct is the first and most obvious landmark of the site. 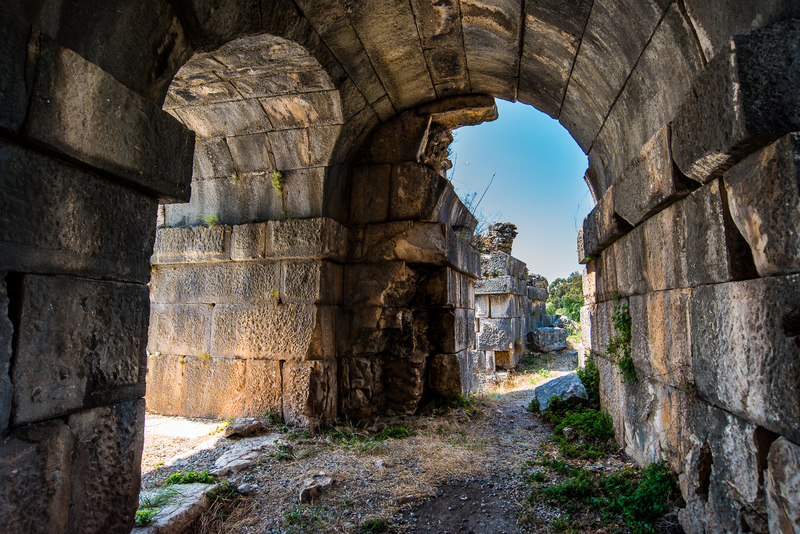 In the 6th century BC, Phaselis was captured by the Persians, then it fell to Alexander The Great. It is said sometimes that he’s golden sarcophagus could be buried somewhere in the city, after it was brought from Alexandria to avoid its demolition. The years of Roman rule were the year of constant growth and prosperity for the city. The city was even visited by an Emperor Hadrianus. A monumental arch at the beginning of the main street was built i his name. It’s remains can still be seen near South Harbour of the city. 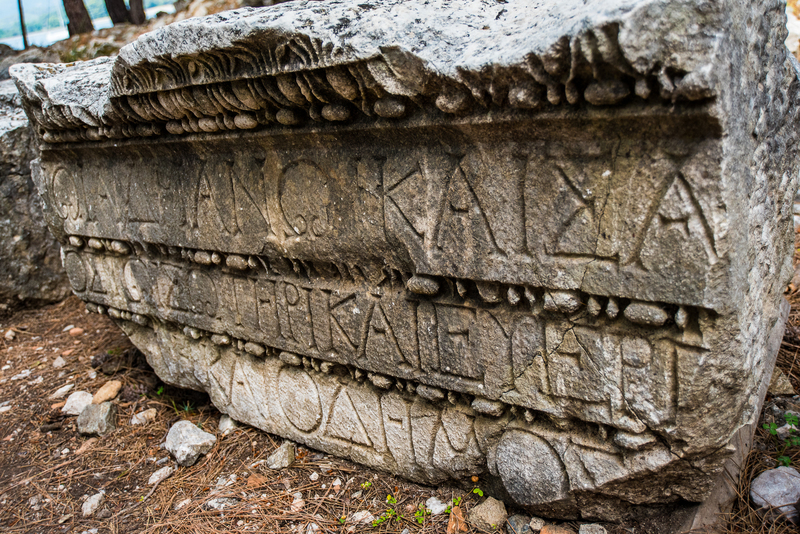 Once again the city was great during Byzantine period, but then pirates and Arab invasions, along with earthquakes and growth of port activity in Alanya and Antalya, Phaselis ceased to exist. 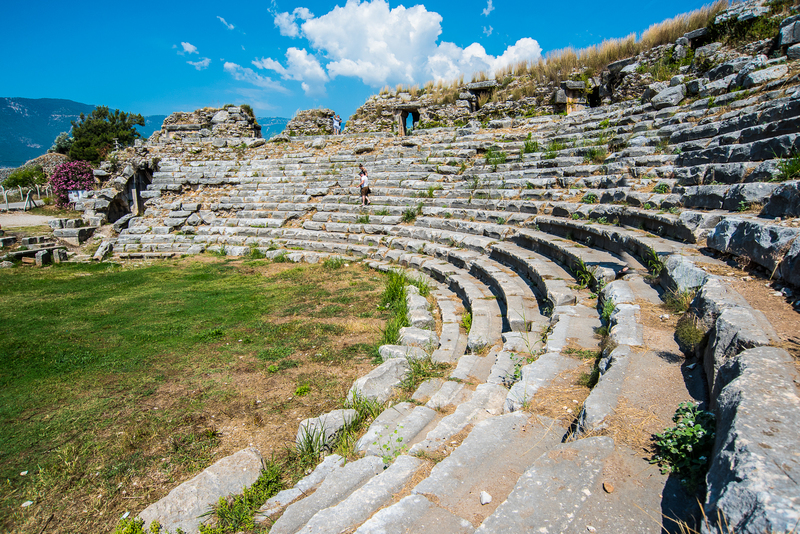 The Roman theater dates from the second century and could hold around 3000 people. 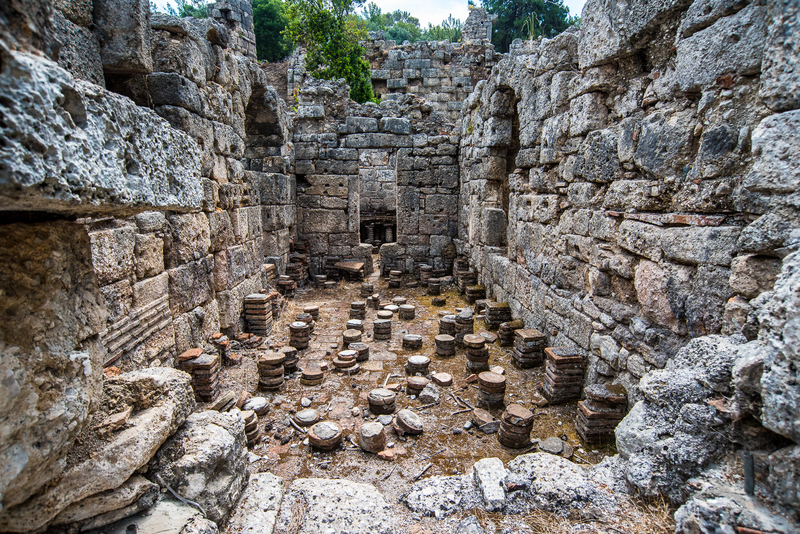 The most of the ruins are from Roman and Byzantine times. 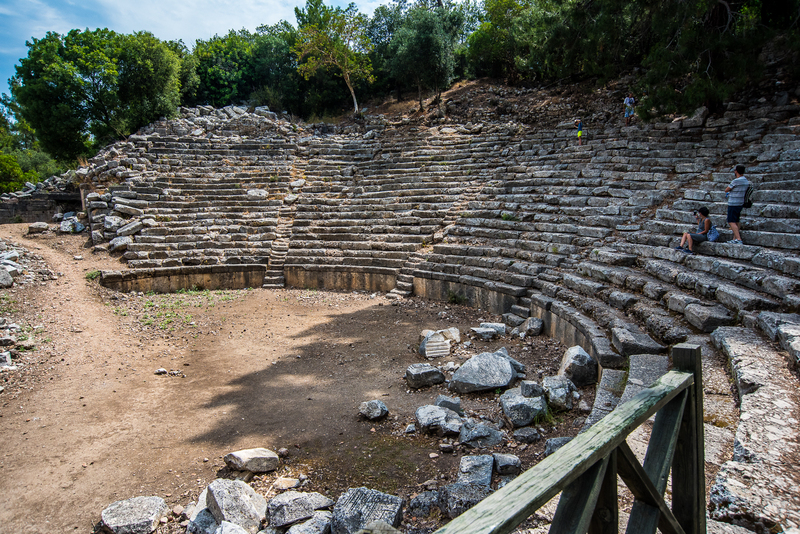 The Aqueduct and the theatre are well preserved. There were two temples in the area, one dedicated to Afina and the other one to Hermes and Hestia, but they are basically non-existant. 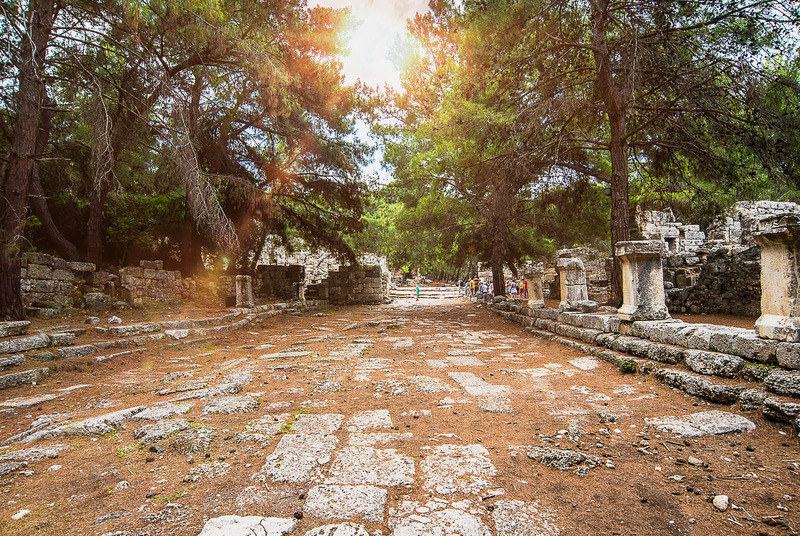 A colonnaded paved ancient street is still leading from the central harbor to the remains of Hadrian Gate. You can see the ruins of bathhouse and some other public building along it. The necropolis is located to the north of the site. 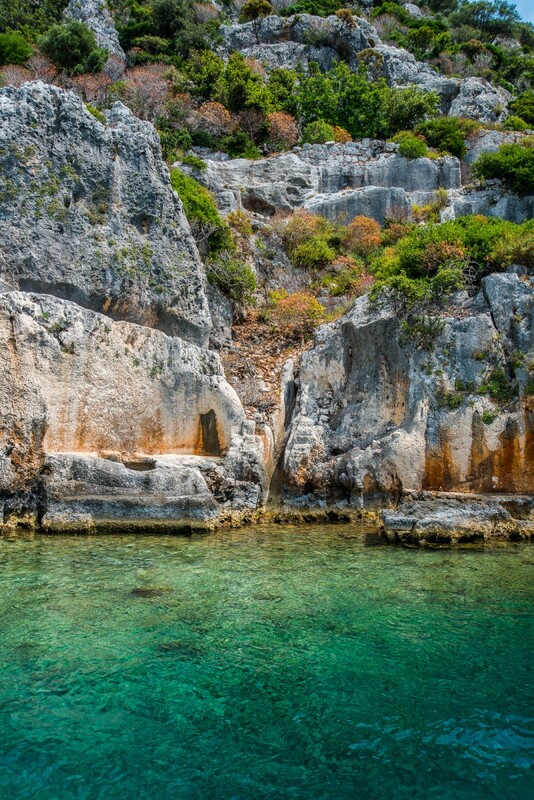 The closest airport for getting to know Lycian heritage is Antalya International Airport (AYT), numerous scheduled and charter flights go here from all over the Europe. You can rent a car (from $25/day) for a self-drive trip, or book a tour to the main sites(group tours prices start at $10) in Antalya.